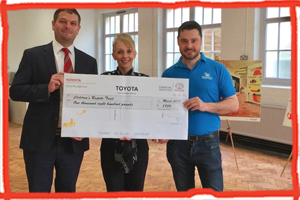 SLM Toyota’s Group Director Jason Barlow and Marketing Manager Mel Ball came to the Children’s Respite Trust recently to present a cheque towards the East Sussex Charity’s new Uckfield Respite Centre. The money was given as a part of Toyota GB’s Fund For A Better Tomorrow initiative, in which individual dealerships are given the opportunity to support worthy local charities. Over 20 suggestions were put forward to the Uckfield dealership and we’re delighted that the Children’s Respite Trust was chosen. The money will be used to complete the kitchen at the Charity’s new Respite Centre in Uckfield, where children will be able to join in with baking and other activities once it is fully operational. ← Ernest Kleinwort, Funding For Our Future.